I grew up eating this Punjabi black eyed pea curry. It’s warm and comforting and the beans are so rich and buttery! This is my mom’s recipe – although, hers is slightly different every time she makes it because she doesn’t use “measurements” when she cooks (real deal Indian mamas don’t do the whole “measuring” thing). I’ve also adapted this recipe so that you can make it in an electronic pressure cooker, like an Instant Pot. I’m sure you can also easily adapt this to make it on the stovetop too if you’d like. The great thing about black eyed peas is that they don’t take as long as other legumes to cook. 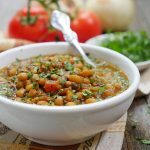 You don’t need to soak the beans at all – but I always soak legumes to help reduce phytic acid (more info on that here). During my pregnancy, I ate this dish pretty often because black eyed peas are high in calcium and I actually tolerate soaked & prepared beans better than I tolerate most dairy. This recipe not only tastes great, but it makes me feel good too. 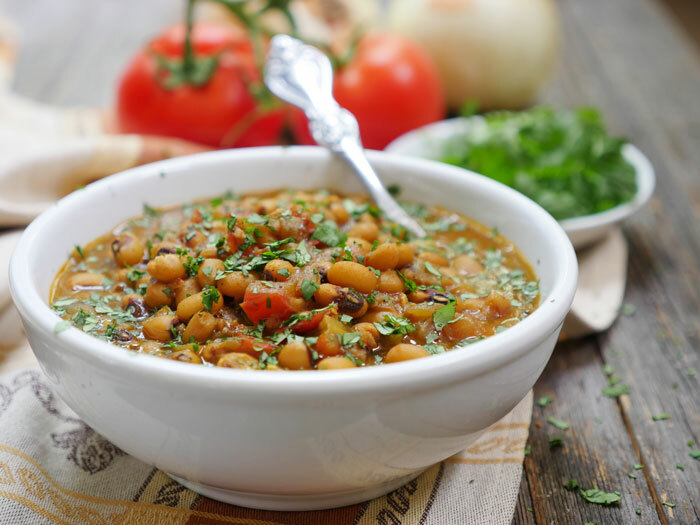 It’s hearty, rich in fiber, high in protein and as I mentioned – a good source of dairy-free calcium (1/2 cup of black eyed beans has 185 milligrams of calcium). We always make this recipe on New Years Day in our house because it’s thought to bring good luck. I always thought this was an Indian superstition (or maybe just a thing that we believed in our house? ), but it turns out that black eyed peas are considered good luck in many other cultures too! Even here in the US (mainly in southern states). I wouldn’t wait for a holiday to make this though – it’s so easy that you can make it any time you want! My hubby, who isn’t a huge fan of legumes, loves and requests this curry often. He also likes my dal makhani so try that too if you get a chance. 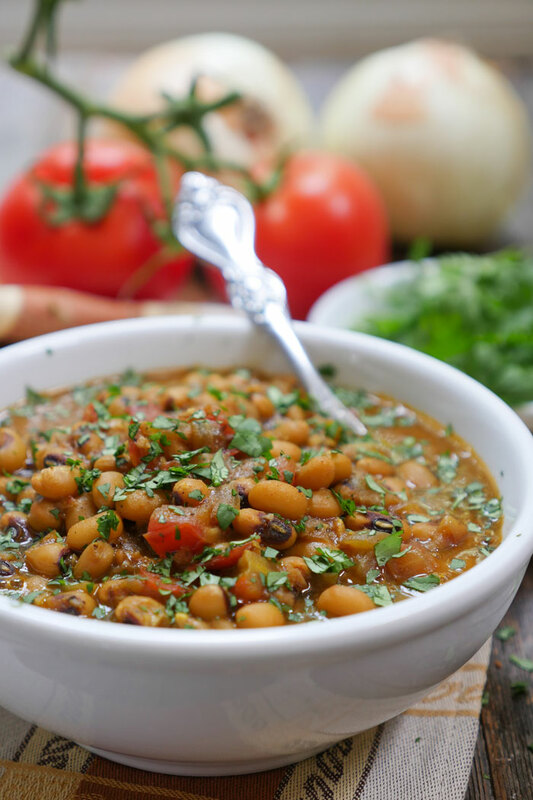 Serve this black eyed pea curry over some rice, cauli-rice, paleo naan or you can do what I often do and eat a bowl of it on its own. 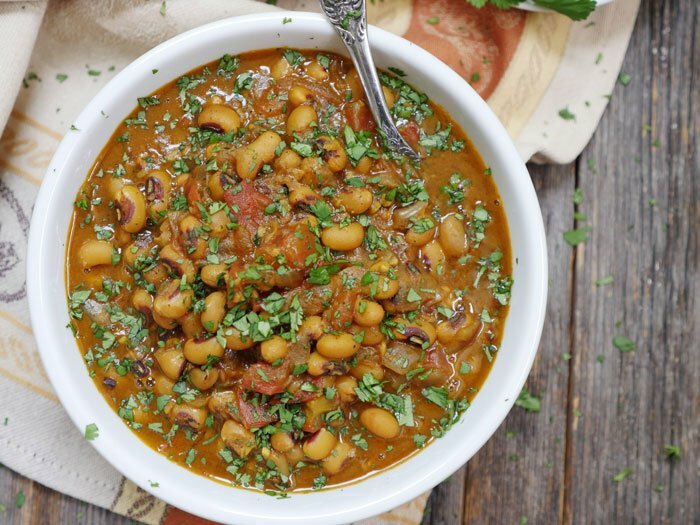 This popular Punjabi dish, also known as lobia masala, is made with buttery black eyed peas. This is a recipe that’s almost always served on New Year’s Day in our house because it’s thought to bring good luck. Don’t wait until then to make this though! Soak the dried black eyed peas in cold water for 1-2 hours. Drain, rinse and set aside. Press the sauté button, and add the oil and allow it to heat up for a minute. Add the cumin seeds and once they begin to turn brown, add the onion and bay leaf. Stir-fry for 6-7 minutes, or until the onions begin to turn brown. Add the garlic, ginger and spices, stir, then add the diced tomatoes. Cook for 2-3 minutes, or until the tomatoes break down. Add the drained black eyed peas to the pot along with the 2 cups of water and mix well. Secure the lid, close the pressure valve and cook for 20 minutes at high pressure. Looks like either the ingredients list is missing lentils, or step 6 is there in error… Will try this recipe soon. What would the measurement be if we are using canned black eyed peas? I used 2 cans of black eyed peas and 1 cup of water. Pressure cooked for 6 minutes. Had to boil off a little water at the end and thicken with a bit of corn starch! Do you ever use frozen black eyed peas? How does it affect the cooking time? It sounds like this is made with some sort of pressure cooker. If you don’t have one, how would you make this dish using a regular pot? Thanks for your help and Happy Holidays to you and your family! Shauna, I’m so happy to hear that!! And wow, your little one liking this curry makes my day! This was my very first Instant Pot recipe in my maiden journey of learning how to cook! Thank you! Another winner! I did this in a stove top pressure cooker and cooked it for 6 minutes after an hour of soaking with a quick release. We had this instead of hoppin’ john on New Year’s Day. My husband, 7,5, and 2 year old loved it (I left out the cayenne). My 5 year old said this was much better than hoppin’ john and renamed it poppin’ john and requested that I not just make it on New Year’s Day. I made this on New Year’s Day and the kids 7,5, & 2 loved it. I usually make hoppin’ john for luck and my 5 year old said this was so much better and renamed it poppin’ john. She requested that we not just have this on New Years. Thanks for another winner! I made it in a stovetop pressure cooker after an hour of soaking and did it for 6 minutes with a quick release. It was perfect. Katie, I’m so happy to hear that! And I love the name poppin john LOL. I want to try this, but I worry whether 30 min is too much. I have done black-eyed peas in the instant pot before, and even without any pre-soaking they were very soft (almost a bit too mushy) after only 25 minutes. I made this last night while cooking our food for the week, and it’s delicious! I used about a third of the amount of cayenne called for, and do wish I’d left it out–while *I* really like it, I think my kids will balk at the spice level and it seems as though it would be plenty flavorful without the cayenne. Still, I think my kids will still enjoy it with a dollop of whole milk yogurt on top. So good–thank you! I tried your recipe and I love it. Thank you. Made this for dinner tonight, and have to say Wow! It was so good. Thank you! Looking forward to trying other recipes from your site. Tom, I’m so happy to hear that! I hope you’ll let me know what you think of any other recipes that you try! I left the beans soaking for about 3 hours instead of the recommended 1 or 2, and this came out as soup. Very runny. The spice level (as in the directions) would have been great had it been a thick sauce on beans, as pictured, but as soup it was overpowering. I know I put in exactly the 3 cups of water (24 ounces) as directed, so that was not the problem. Could “over-soaking” have caused this soupy result? This was only my second Instant Pot effort, so it was discouraging. Any advice? Thanks! Hi, I tried this and while the flavour was great, it came out very soupy. And I mean extremely runny. Followed the recipe to a T with one exception. I soaked the beans for about 3 hours instead of the recommended 2. Would this be enough to alter the outcome so significantly? Thanks. I’m new to instant pot (this was my second recipe to try) and am discouraged with my result. Hi Sue, no that wouldn’t have done it. I’m not sure why it came out soupy – you can always hit “saute” once it’s done to boil off any extra liquid though. Hi ~ This looks delicious!! What would you recommend for those who are trying not to use oil. I’m new to using an Instant Pot. Thank you! Can you add chicken to this recipe …any adjustment needed for time , liquid or ingredients ? back on the water by 1/2 cup because I would prefer it a little drier. The black-eyed peas were perfect. This was my first time eating them. My wife who says she does not like Curry (curry powder) also loved the recipe. Brilliant! I have never posted a food review before, although I use online recipes often. I’m not a natural cook. I felt I had to post this one. Wow! It was fantastic! Growing up, black eyed pea soup was a regular in my house. I loved it. Have often craved it as an adult, but have been disappointed on the rare occasion I would find it anywhere. It would be bland. This was my first tryout recipe with my brand new Instant Pot Mini. Actually, I bought this pressure cooker with making this recipe in mind. That’s how much I love black eyed peas! I followed the recipe almost exactly. Soaked dryed beans for an hour, and used coconut oil for cooking. Substituted 1/4 cup white wine for equivalent water. Why? It was in my fridge, and didn’t want to waste it. I also used tomato sauce instead of a tomato. Why? I forgot to get an extra tomato at the grocery store. I guesstimated at about 1/4 cup. I knew it would taste good, because of all the spices. I wasn’t ready to be blown away! And I was. It is the best I’ve tasted! I plan to have a pot of this on “warm” quite frequently, throughout the winter. Thank you so much for providing this recipe. Best black eyed pea soup I’ve ever had! Palu, thank you so much for writing a review for me 🙂 I’m so happy to hear that you liked the black eyed pea curry! I am definitely going to try adding white wine next time – that sounds delicious. A perfect start to our New Year! I pre-soaked and cut cooking time to 10 minutes. Added more fresh ginger by my preference. This is so incredible. My first IP try — as well as first black eyed peas. As I love Indian food, this was amazing, fun and now meals for week (doubled recipe). Plan to serve over variety of greens. Look forward to trying out more of your meals. That’s so great to hear! Glad you liked it 🙂 Thanks for letting me know how it turned out for you! I already gushed all over this recipe on Facebook, but I want to add that after my partner and I enjoyed this on New Year’s Day, I gave some to my food-loving vegetarian friend with whom I share my cooking experiments. Not only did she say it was “perfect,” her 91-year old, set in his ways, just make me a tuna fish sandwich EVERY. DANG. DAY. husband ate it too! That’s a major compliment. Making this recipe for the second time today. We absolutely loved it the first time around. The black eyed peas were so tender and the curry transported me back to my childhood. Thank you! Made this for dinner tonight. Followed the recipe but replaced fresh tomato with 1 teaspoon tomato puree. Needed to add a little water once done but other than that came out delicious! This is the first time I cooked black eyed peas and I am so happy I found this recipe. Took little time to make, perfect for weekday supper. My husband who rarely likes vegetarian food gave this the thumbs up!!! This is a wonderful recipe! It is so tasty and it only took a few minutes to put together. I will definitely be making this regularly. This recipe is so simple but absolutely satisfying! My husband and kids eat it all up every time. It’s definitely one of our favorites! Delicious recipe. Made it tonight with some dried peas that had been sitting in the pantry. Really tasty. Hi Ashley, can your onion masala be used in this recipe? I’ve got a big batch in the freezer. Also, any adjustments for fresh peas? Hi Sarah, you can use onion masala in any recipe calling for onions, tomatoes, ginger and garlic – this recipe included 🙂 I don’t know the exact measurements for this recipe but will be sure to update the recipe once I do. The great thing about the masala is that it’s already cooked, so if you feel a dish is lacking in masala, you can always just stir it in at the end. Hope that helps! This looks like a delicious recipe, although I am yet to make it. I’d lik eto know your thoughts about freezing this curry. Will it be fine? The recipe will make quite a few too many serves for me to eat within a couple of days, so I would like to freeze it. I haven’t frozen beans before. John, I haven’t frozen this before but it should be fine. Hope you enjoy it! Thanks for sharing this recipe! If you want to double the recipe, should you also double the water? If not, how much water should you use? Thank you! Thanks for sharing this recipe! If you want to double it, should you also double the water? If not, how much water should you use? Thank you! Can you make this this using your onion masala? Sebastian, so happy to hear that! This is my second time making this recipe. I love love love it. Didn’t have fresh tomatoes so I substituted Muir Glen organic diced tomatoes. So good!!!! Next time I will add the whole can and add more peas. Really really good with Instapot collard greens. Jennifer, I’m so happy to hear that!! Thank you for letting me know how this turned out for you 🙂 And serving them with collards – brilliant! This recipe sounds delicious however I don’t have a pressure cooker. Could you please give me some tips how to cook it right on the stove? Sooooo good. Everyone loved it, even the ones who “don’t like black eyed peas”. Healthy, easy recipe! Thanks! If I use 2 cups of beans it’s 4 cups water And how much time ? Is it still 20 mins manual high pressure ? The perfect curry! And vegan to boot! 🙂 Thanks for such awesome deliciousness.